Four sparklingly original crime writers offer their perspectives on culture and society from different corners of Europe. As they say, tell me about your crimes and I'll tell you about your society. 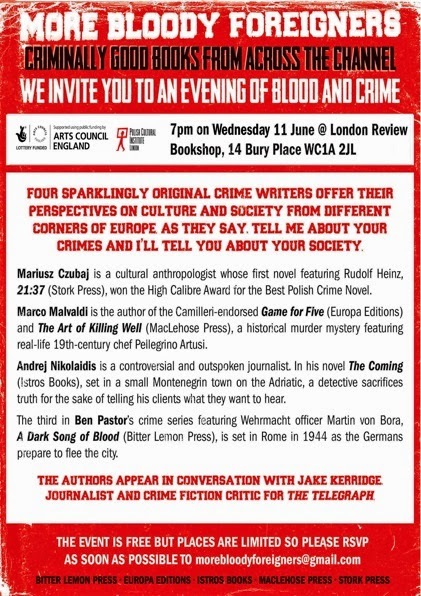 Mariusz Czubaj, Marco Malvaldi, Andrej Nikolaidis, and Ben Pastor appear in conversation with Jake Kerridge, journalist and crime fiction critic for The Telegraph. Mariusz Czubaj is a cultural anthropologist whose first novel featuring Rudolf Heinz, 21:37 (Stork Press, translated by Anna Hyde), won the High Callibre Award for the Best Polish Crime Novel. Marco Malvaldi is the author of the Camillieri-endorsed Game for Five (Europa Editions) and The Art of Killing Well (MacLehose Press), both translated by Howard Curtis, a historical murder mystery featuring real-life 19th-century chef Pellegrino Artusi. Andrej Nikolaidis is a controversial and outspoken journalist. In his novel The Coming (Istros Books, translated by Will Firth), set in a small Montenegrin town on the Adriatic, a detective sacrifices truth for the sake of telling his clients what they want to hear. The third in Ben Pastor's crime series featuring Wehrmacht officer Martin von Bora, A Dark Song of Blood (Bitter Lemon Press), is set in Rome in 1944 as the Germans prepare to flee the city. Organised by Bitter Lemon Press, Europa Editions, Istros Books, Maclehose Press, and Stork Press, with the support of the Arts Council England / Heritage Lottery Fund and the Polish Cultural Institute in London.